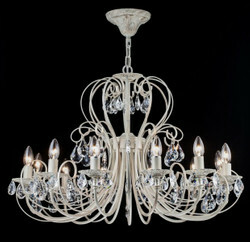 Casa Padrino offers you a huge and wonderful selection of baroque chandeliers. Our baroque-style chandeliers are not just simple chandeliers, but true works of art. Our exclusive selection of chandeliers in the baroque style offers the right eye-catcher for every living situation and every ambience. Give your reduced and minimalist interior that certain something. But even playful furnished apartments or even discos and bars are perfect for a chandelier. He should be modern and extravagant in order to be the center of attention. Our entire chandelier collection in the baroque style from Casa Padrino is completely handmade. In addition, we use only the highest quality materials to ensure the highest quality standard for your needs. You will always be able to enjoy a noble and glorious appearance with these lights and evoke enthusiasm among your guests. The noble and stately chandeliers decorate your bar feudal and guarantee to be a real eye-catcher. At Casa Padrino your imagination is almost limitless. In our online shop you will find a wide selection of different styles and colors. Always with the right mix of glamor and style. To get an idea about our products in our online shop is one thing. But it is even more fascinating to experience our baroque chandeliers directly and to convince yourself of the quality on site. If you happen to be around Essen (Germany), we would be happy about your visit. In addition to the wide range of immediately available baroque chandeliers, we at Casa Padrino also offer you the opportunity to have custom-made products made to customer specifications. For further information about the complete offer just call us on + 49-201-36577485 and our qualified support will help you in every detail! Guaranteed! Casa Padrino, your baroque wholesale on the internet and on site.